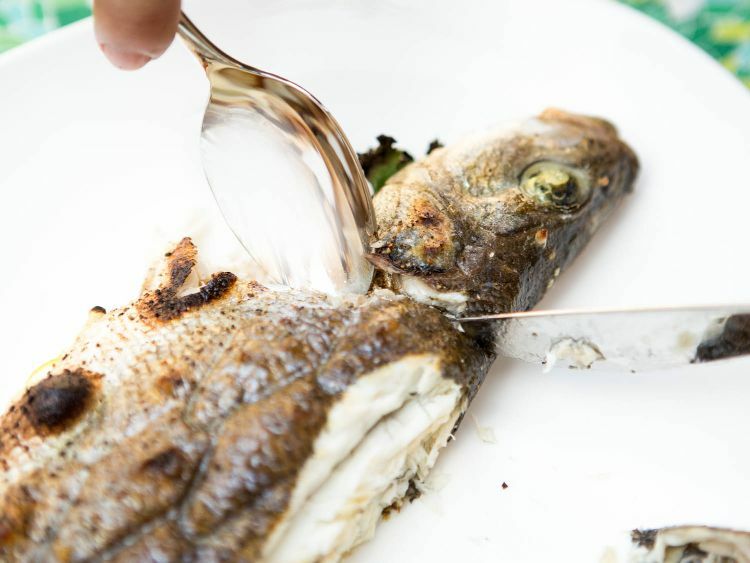 Serving a whole cooked fish can be elegant and sophisticated, but not everyone will appreciate it. Heads and tails can make some people a bit squeamish, while others can be intimidated at the thought of having to remove all those little bones on their own. So when serving guests, take care of this task for them. They'll appreciate it, and you'll look like a pro! 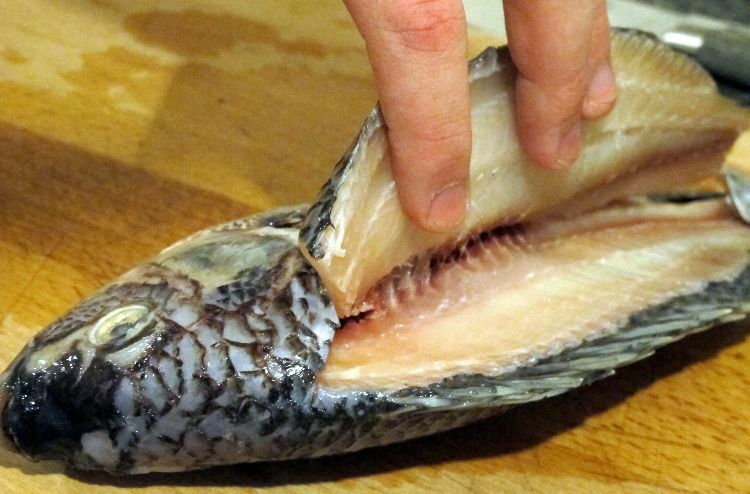 Some people get intimidated at the thought of filleting a fish, regardless of whether it's already been cooked or not. But once you try it, you may find it's easier than you thought. And when it's cooked, it's even easier because the flesh flakes even more easily off the bone. Follow the tips below and you won't just be able to do it for your guests, you'll be excited to! 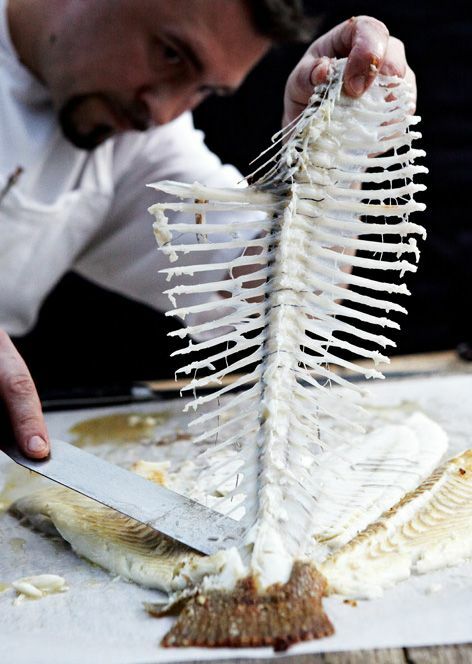 In order to fillet a fish you need to be able to get into the flesh and separate it from the bone. And that means you'll need to cut through the skin. This is the part that can be most intimidating to many, but it's fairly easy to do. Simply find the ridge where the fin was located and cut to the side of it. Cut to the left side and continue cutting towards the neck, stopping just short of it. 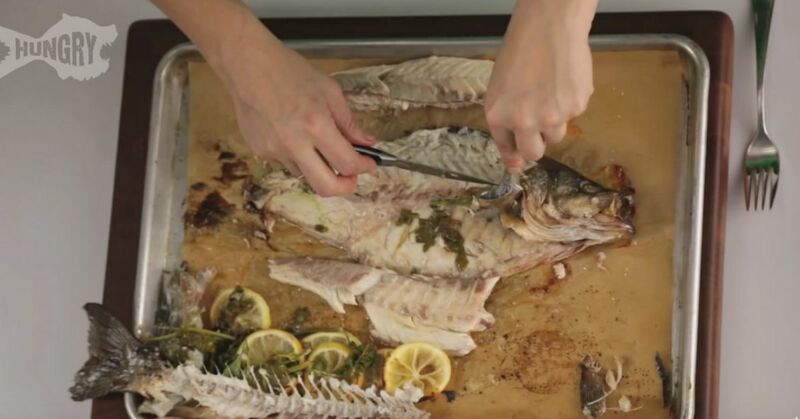 Once you reach the neck, turn your knife and make a cut parallel to the neck towards the bottom of the fish. Once this cut is made, it will make the fillet more workable. Gently pull the flesh from the cuts you just made down so you can see both the bones and the flesh. Once the fish has been opened, run the flat side of your knife blade between the flesh and the bone. You're not cutting here, just working the knife in between the two in order to separate them. It's also important to remember to be gentle. When the fish is already cooked the flesh will be very flaky and if you want to serve whole fillets, they can come apart very easily when they're this delicate. If the head is still attached, cut it off using a straight downward motion close to where you made the incision near the neck. But don't throw it out! This will make a lovely fish stock. To remove the skeleton, gently lift up either end of the skeleton running through the fish and it should lift up very easily from the flesh. Keep that for stock, too! If you're working with a smaller fish, you may just need to remove the fillet and use it as one portion. But if the fish is larger you'll want to portion it out into fillets of the same size. To do it, cut the fillet in half right down the center so you have two pieces. Then cut those two pieces in half, making four pieces, and so on. This will give you even portions without a lot of fuss on your part. It's important to remember that the fillet will be a bit smaller as you work down towards the tail so you may want to make these portions a little wider than the others so you still have even pieces.